I arrived at the orphanage at night and within the first few seconds of me taking a step out from my ride, I literally had kids unabashedly hugging and clinging on to me left and right. When I first told my family and friends I was taking a break from work to make a volunteer tourism trip to West Africa in order to satiate a slice of my wanderlust, the images conjured to the forefront of their minds was usually that of malnourished little children and violent, civil unrest. Such was not the case in Ghana. 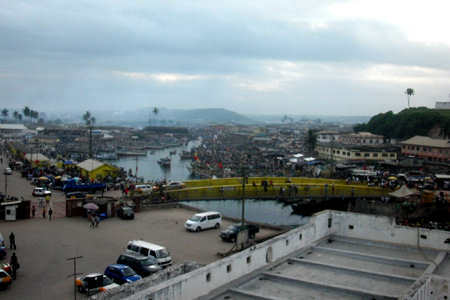 Situated on the West coast of Africa with the Atlantic Ocean to its South, Ghana exemplified a generally peaceful coexistence between tourists and locals, Muslims and Christians, young and old, the modern and developed — all mixed and held together by an obscure blend of lively free spirit. On one hand there were the areas more obviously catering to tourists which included a developed mall (complete with a movie theatre and clean flushable public toilets), cars, paved roads, nice hotels, fast food joints and Western restaurants. 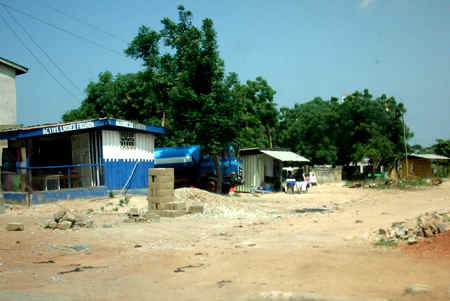 However, the area where I stayed in the capital city of Accra looked to be a conglomerate of little villages made up of rickety shacks and connected by dirt roads. Even within one city, the disparity between rich and poor covered quite a range and I was determined to experience the full Ghanaian culture and life in semblance to the locals as closely as I possibly could. “Akwaaba!” meaning “welcome!” was the first word in the local language of Twi to greet me, and indeed when I first arrived, I found every Ghanaian local I met quite welcoming. In addition to their local language, most people spoke at least some semblance of broken English. Two Ghanaian men from my volunteer organization picked me up in a minivan and drove me from Accra to the orphanage where I was placed in a town called Ofaakor. A drive that would have originally taken an hour evolved into a painfully slow, traffic-induced five-hour ride with my local companions who spoke limited English. Each time our vehicle slowed down, street hawkers carrying their goods on their heads, attempting to sell food or children’s toys, weaved and intertwined between the rows of cars like performing some intricate dance that dispersed once traffic began to flow again. I passed by numerous fields lush with green foliage rather than desert landscapes and witnessed children running here and there unsupervised, the younger ones milling around playing with whatever they could find, while the older boys engaged themselves in games of football until sundown. The first lesson I learned came to me as I made my way through the streets without a male to accompany me for the first time. Local people stare at foreigners. Let me be more specific. Local men stare at foreign women. Not only was there a lot of staring, I quickly found men were incredibly brash in voicing their love for foreign women, which included physically grabbing my hands or arms when I tried to ignore them. At first I reacted politely because here I was in a new country without knowledge of their language and I was afraid I would offend someone which could lead to who-knows-what kinds of unpredictable events. By the end of the trip I learned the easiest way to fend off unwanted attention was to walk fast and with purpose, as if I’m in a rush to get exactly where I knew I wanted to be, even when I didn’t, and to wear an unfriendly no-trace-of-a-smile expression on my face. Even so, not everybody caught the hint and though the attention was more annoying than dangerous, the most effective way to fend off the persistent affections of Ghanaian men was to travel with a male. Drinking water came in little plastic water sachets that you rip open with your teeth, and my second lesson learned was that there was barely any sense of time for Ghanaians. 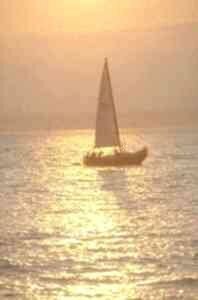 People got up when the sun rose at 6 am and went to bed when the sun set at 8 pm. Things happened when they happened, no earlier, no later. The volunteers and I once set up a specific meeting time with a painter who was to show us where to buy materials for us to paint one of the old school buildings at the orphanage; he'd turned off his phone so we couldn't contact him and decided to show up 4 hours later without any sense of remorse or urgency. It is that exact underlying simple and laid back, carefree mentality which permeates the air in Ghana that can lead to frustration, but once understood and embraced, contributes to the country’s endearing charm and defining veneer. Living conditions at the orphanage weren’t horrible, but it was most definitely not anywhere near what I was used to back home. There were lizards and large insects on the wall, dozens of mosquitoes at night, dust and dirt everywhere, and the volunteers shared one washroom that was basically an unflushable port-a-potty. Everybody brushed their teeth and washed their faces outside and the electricity didn't work half the time. After taking a bucket and drawing water from a pump, I had to wash in a shower space that basically consisted of a tiny, dimly-lit room with a small bench and a drain in the ground. I seriously rejoiced every weekend because the volunteers would all take a break from living in conditions as most locals did, to go sightseeing and enjoy “tourist” luxuries like staying at a hotel by the beach and eating western food such as pasta, as opposed to the bountiful carbs of plain rice and fufu that was provided for us at the orphanage. While the accommodation at the orphanage left something to be desired, the children and people I met during my stay more than made up for it. I arrived at the orphanage at night and within the first few seconds of me taking a step out from my ride, I literally had kids unabashedly hugging and clinging on to me left and right. I delighted in the bluntness and open spirit of the children who would approach me and raise their arms up to be held by me, a mere fleeting stranger in their lives. After riding a Tro Tro, a vehicle of the local public transit system which was a small van operating on random times and crammed full of people, my friend Sookie and I arrived at a small beach village called Kokrobite. This was perhaps my favourite place to visit, a spot where an eclectic mixture of tourists, locals, traveling painters selling their wares, and other foreigners aggregated in an exhilarating carefree liveliness of Rastafarian culture. Kokrobite residents and visitors seemed not to do much else than literally relax and enjoy life all day. 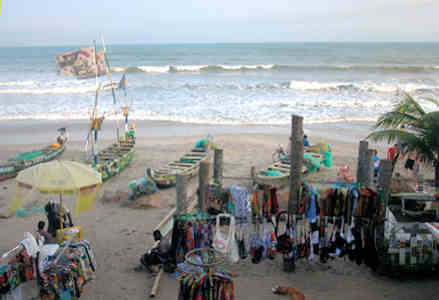 A prime location for purchasing handmade souvenirs, enjoying the ocean and sipping drinks on the beach, I was reminded not to become too intoxicated with reckless abandon when I heard an announcement over the loudspeakers of a woman who had just gotten mugged on the beach. The days were dedicated to eating burgers whilst lounging on the sandy beaches, watching boys join in games of football and browsing through locally crafted wares while the nights were a tribute to enjoying drinks under a starlit night sky and mingling with other travellers, sharing stories and creating more. On a night called Culture Night at the popular place of Big Milly’s Backyard, there was an energetic show of traditional African drumming and dancing. As soon as I realized the local performers were pulling foreigners up to the front to dance with them, I turned to my friend and grabbed everything she was holding into my lap. Surely it would be too bothersome to persuade someone with too much to hold to dance her way to the front and make a fool of herself in front of everybody watching. Not so. As I clumsily mimicked the movements of the Ghanaian dancers, I realized the full experience in embracing this culture would require me to let loose and mimic not only their movements, but their light-hearted approach to enjoying life as well. Cape Coast was another place Sookie and I visited on our weekend excursions away from the orphanage, and proved to be one of the hotspots for sightseeing in Ghana. With the feel of a larger, more urban city than Kokrobite, it was here that we joined a narrated tour of the Elmina Slave Castle to retrace slavery’s past and connect with one of the darker sides of African history. It was a haunting and almost sacred experience walking through rooms and breathing the air of the same castle that had centuries ago once facilitated the trading of human bodies. 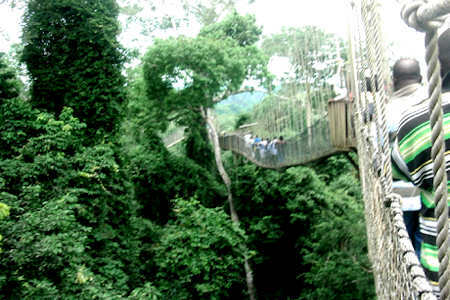 On the same day, Sookie called her taxi driver friend who drove us to visit Kakum National Park and after a guided moderate hike uphill through a rainforest of evergreens within the park, arrived at the much-anticipated canopy walkway. Sitting on a bench in the treetops waiting for other people to go ahead of me, hesitation was not an option as the guides less-than-gently urged those who looked uncertain onwards. At canopy level, although I was never one to be afraid of or get sick from heights, walking single file, after the fourth swaying bridge, I began to feel the tiniest bit dizzy. It was not enough to deter me from finishing the walk and enjoying the view of the lush vegetation that comprised the structure of the rainforest. After the completing the walk, as my friend and I sat down for a drink to replenish the liquids the hike had taken from us, Sookie noticed two young boys sitting a little way away looking suspiciously like they were hiding something every time we cast a glance in their direction. We soon realized it was a camera and that they had been trying discreetly to take photos of us for one purpose or another. I suspect they probably did not get a chance to see many East Asian women in their daily lives, but whatever the reason, it did make me feel just a little bit like a celebrity. Taking the Tro Tro back, our vehicle hit one of the numerous goats that roam freely across the roads. The incident was resolved without much fuss as the driver discussed with the goat’s owner and I suspect settled with a sum of money. 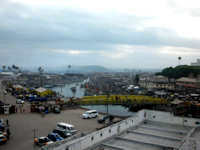 I’ve placed much emphasis on the mellow atmosphere in which people in Ghana thrive on, but have not mentioned that Ghana is also quite a religious country and with numerous shop names like “Jesus Saves Hair Salon” and “Praise The Lord” written in big bold letters on the backs of taxis, the residents there are anything but shy in expressing it. The streets of Ghana were perpetually lively, full of color, conversation and food, and never lacking in company. Surprisingly, I always somehow managed to find my way around and it was only when the time came for me to leave that I felt a sense of loss at having my stay in this unique country come to an end. Click the camcorder symbol above to watch a video related to Kenya — or click here for Kokrobite Beach.